A new walk-in urgent care clinic in the Kingston Emporium hopes to compliment the University of Rhode Island’s existing Health Services by offering students additional access and choice in their on-campus health care. Family Doctor Plus, which opened last month, plans to have extended hours to help decrease the load of URI’s Health Services, according to owner Will Welter. “Our goal is to have a cohesive partnership to augment the health care facilities at the university,” Welter said. Although hours are not yet concrete, Welter says the clinic plans to stay open until 10:00 p.m., later than Health Services’ 8:00 p.m., and be open on weekends, although he says they will begin by being open five days per week. They will also be open year round. Although they stress that they do not see the clinics opening as competition, Health Services staff are worried students do not realize what is already offered – and paid for – in the Potter Building. “This isn’t a business or a competition thing. My concern is I don’t want students out of lack to knowing what we do here, paying for a service they’ve already paid for. We don’t want them to think they need to pay to see somebody if we can provide that service to them,” said Medical Director Fortunato Procopio. Health Services Director Ellen Reynolds explained that, regardless of whether they use the university’s insurance or have their own plan, all students pay a Health Services fee as part of their tuition in order to take advantage of what they offer. Students will not be charged a co-pay for visiting. Although it is likely their personal insurance would be accepted at another institution, including Family Doctor Plus, they will still be charged a co-pay. Reynolds also explained that Health Services also offers free over-the-counter medications for low-level illnesses like colds and sore throats to students, which are all paid for through student fees. “You paid for it,” Reynolds said. Welter also noted the attractiveness for students of having another option that is not linked to the university, out of the potential for student’s fears that their medical information and personal history could be linked to their student ID number and shared with parents and even faculty. “Sometimes I fear that students think we’re part of the university from the perspective that we’re going to call their professors and say they’ve got a problem,” Precopio acknowledged. (HIPAA) that prevent them from sharing any personal health information without consent. Additionally, universities and other educational institutions are bound by laws like the Family Educational Rights and Privacy Act (FERPA), protecting the privacy of students’ educational records. “We’re in a medical system first,” Precopio assured. 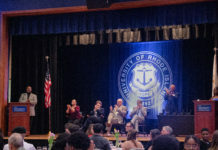 URI’s Health Services is one of less than 20 university health care establishments in the country to be Joint Commission Accredited, the “gold standard in health care,” according to Reynolds. Health Services regularly undergoes the same inspections and surveys that most full size hospitals are subject to in order to receive their accreditation. Reynolds says this is a testament not only to the range of services they offer students, but also the quality at which they perform them. Along with the pharmacy, Health Services boasts a lab, x-ray, urgent care and more, backing up what Reynolds says is a “comprehensive health care service.” More recently, they also added sports medicine specialists, accessible not only to club athletes, but any students with athletic-type injuries. Family Doctor Plus has a lab and x-ray off-site in their partner location in Wakefield. Despite everything they offer to students, Health Services does not extend these to faculty or staff. “We’re here because of the students,” Precopio said and Reynolds acknowledged that there is a “role for [Family Doctor Plus] to play,” referring to their ability to serve non-students. “We really want there to be no barrier to [students] getting access to services and getting them back to the classroom,” Reynolds said, highlighting their primary objective to support student’s academics. “I don’t think the presence of [Family Doctor Plus] is going to cause us to change what we do,” Procopio added.